Digi International Inc, a market leader in networking products and technologies has just unveiled a miniature RF module that enables long distance and reliable wireless transmission targeted for remote devices connectivity. Named as XBee-Pro XSC, it is a powerful RF module that is claimed to able to achieve an impressive far distance network connectivity without wire up 15 miles radius under line of sight condition. 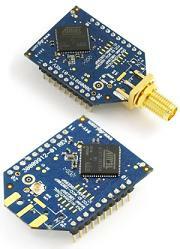 The tiny RF module, designed in its famous postage-stamp form factor is operating at ISM 900 MHz frequencies. Its transmit specification of 100mW output power is claimed to be able to reach up to 15 miles range with high gain antenna without any blockage under line of sight environment. While it seems to be hard to believe such a powerful coverage but users may have to stick back to ultra low 9.6kbps data transmission rate for asynchronous serial data stream. Good thing is, it supports both point-to-point and point-to-multipoint topologies utilizing FHSS (Frequency Hopping Spread Spectrum) technologies and most importantly, it is affordable with no complicated configuration required as a fast and easy-to-deploy total solution. Priced at only $57.4 per module (quoted in 1000-unit pricing), the XBee-PRO XSC is compatible with its existing networked product lines and can serve as a technology module conversion to Local WiFi, cellular network interfaces, serial as well as multiple IO functionality.